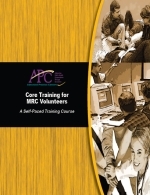 This tool is an interactive CD-ROM training program that guides the audience through various topics that conform to the newly updated Medical Reserve Corps (MRC) Core Competencies Matrix. The tool covers a variety of topics such as Disaster Preparedness, Universal Precautions, HIPAA, and many others that are essential for the proper training of volunteers. The CD-ROM also provides other resource links for additional training, videos, course map, and exercises for self-assessment. The customizable training tool will be most useful to MRC unit leaders to implement in their jurisdiction to help train their volunteers. The current updated version based on MRC core competencies was reviewed by local MRC unit coordinators and NACCHO MRC review team.